Buying coconut milk used to be a headache when I first moved here because I couldn’t tell the difference between coconut milk, coconut cream and coconut milk lite. In Singapore it’s really easy because I usually just buy the fresh ones and there are only two types – big size and small size. But thankfully now I know the difference! 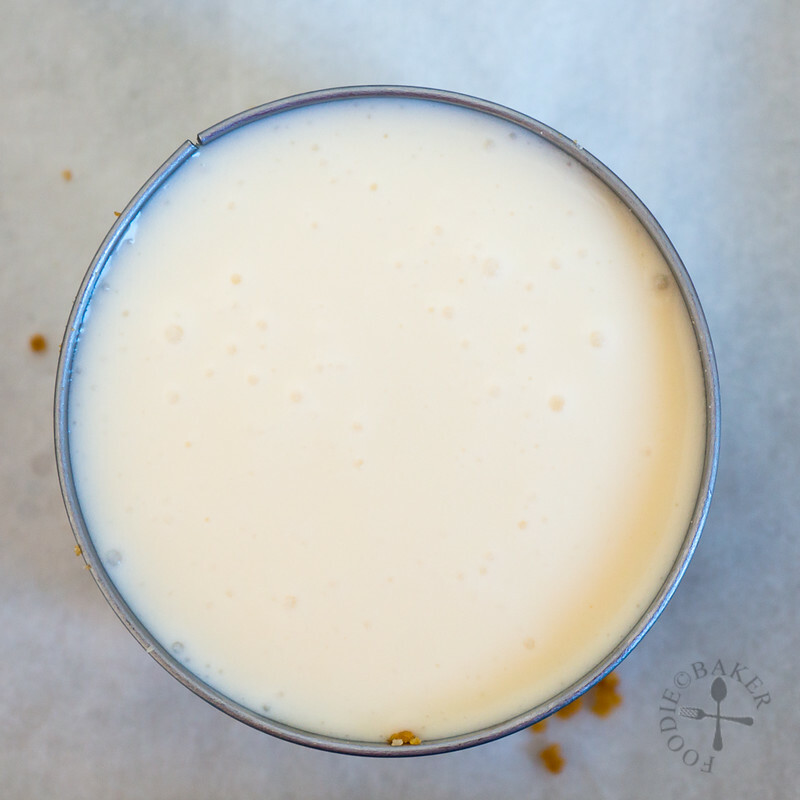 Coconut milk has a heavy cream consistency and is the one that I use most of the time for curries and baked goods; coconut cream is really thick and firm and from what I read, it can be used as a whipped cream substitute; and lastly, coconut cream lite is essentially diluted coconut milk, which means it has less fats than the regular one, which also means that the richness and flavour have been sacrificed. I bought one coconut milk lite before once and I don’t think I’ll buy it again – it’s too watery and I feel that some fats just cannot be sacrificed! Anyway I digress. What I actually wanted to say is I usually find myself with leftover coconut milk because each can has about 400 grams worth of coconut milk and since I’m only cooking for 2 people, I don’t need all of that to make a pot of curry. So besides using them up to bake pandan cakes, this time I used it to bake some coconut cheesecakes… mini ones! 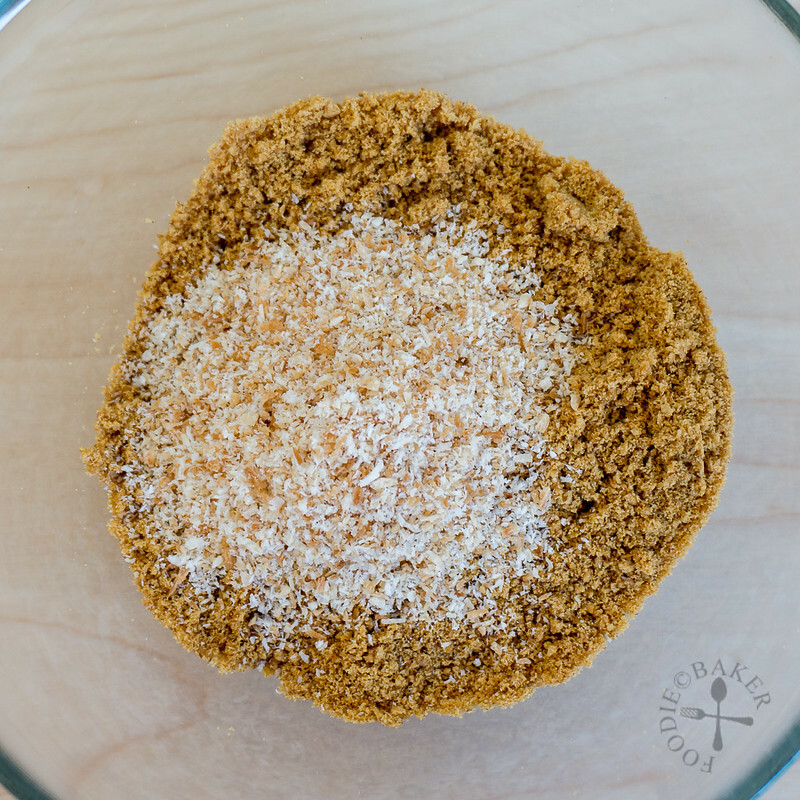 This cheesecake has 4 components: crust, cheesecake batter, butterscotch sauce and toasted coconut flakes. The crust was a simple digestive crust, though I added a little bit of toasted coconut flakes in it as well; the cheesecake batter was a basic one with coconut milk in it; the butterscotch sauce was there so I could take the photo above (haha) but to be honest, it actually goes really well with the cheesecakes… in fact I think all cheesecakes will love to have butterscotch sauce next to them; and the toasted coconut flakes was added for an additional coconut-oomph (and yea, so that I could take the photo below haha). I love mini cakes so I baked them in small 2.5-inch cake rings, so each mini cheesecake is the perfect size for 1 to 2 persons. 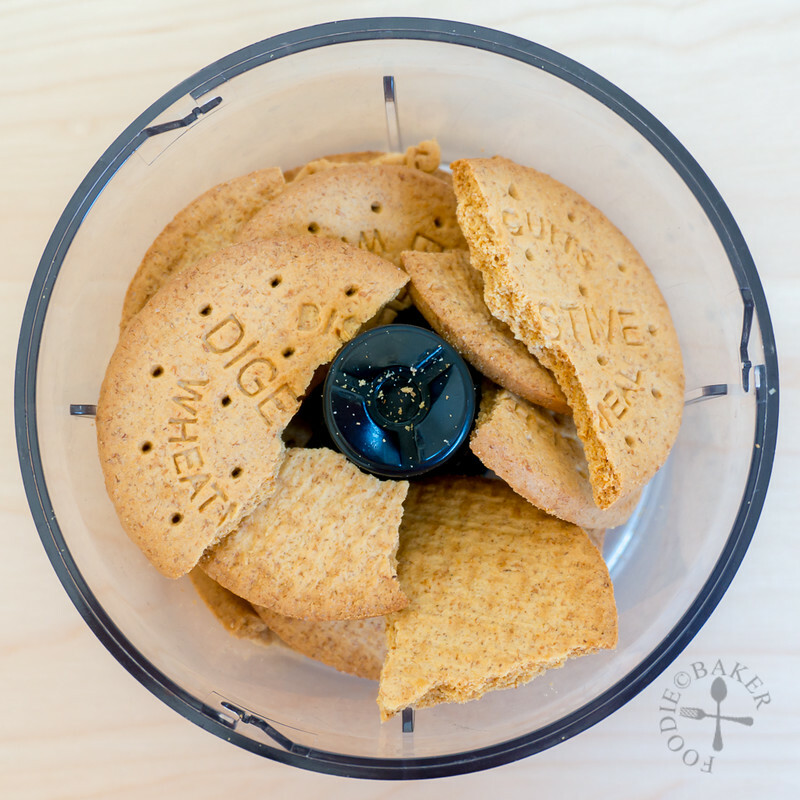 The crust is on the thick side (because I love digestive crusts!) so you may want to reduce the quantities used by about 25% if you are not a fan. For a full-size standard cake, double the quantities and you’d have enough to bake a 7 or 8-inch cheesecake. I couldn’t really taste the coconut in the cheesecake itself, but with the toasted coconut flakes on top made a huge difference and delivered a tasty and delicious coconut-y flavour with every bite. The cheesecake itself is not too sweet, so the addition of the butterscotch sauce did not make the whole dessert overly sweet or sickening. In fact, I actually liked the sauce to be on the saltier side so it’s more like a salted caramel sauce (but that’s just me because I don’t have an overly sweet tooth). 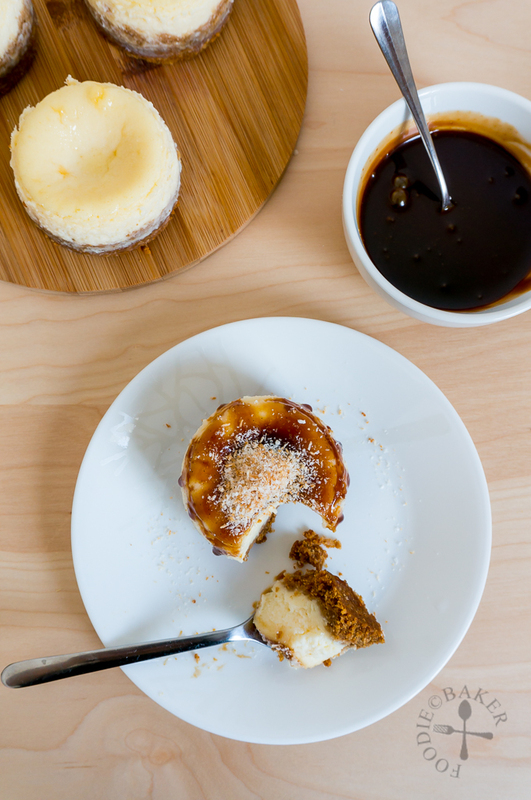 I also love the fact that all the components can be made ahead of time – cheesecakes and sauce can be stored in the refrigerator while toasted coconut flakes can be stored in an air-tight container. 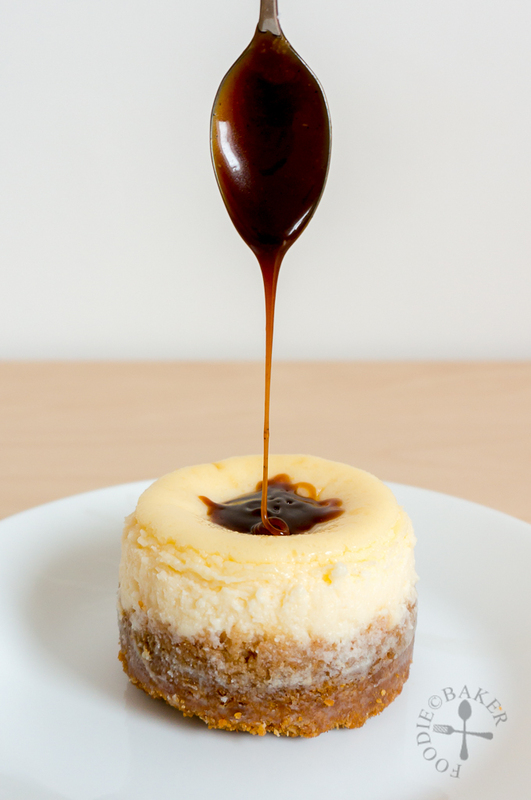 Just warm up the sauce a little so it’s of a pourable consistency, then assemble the cheesecakes and you are ready to serve! 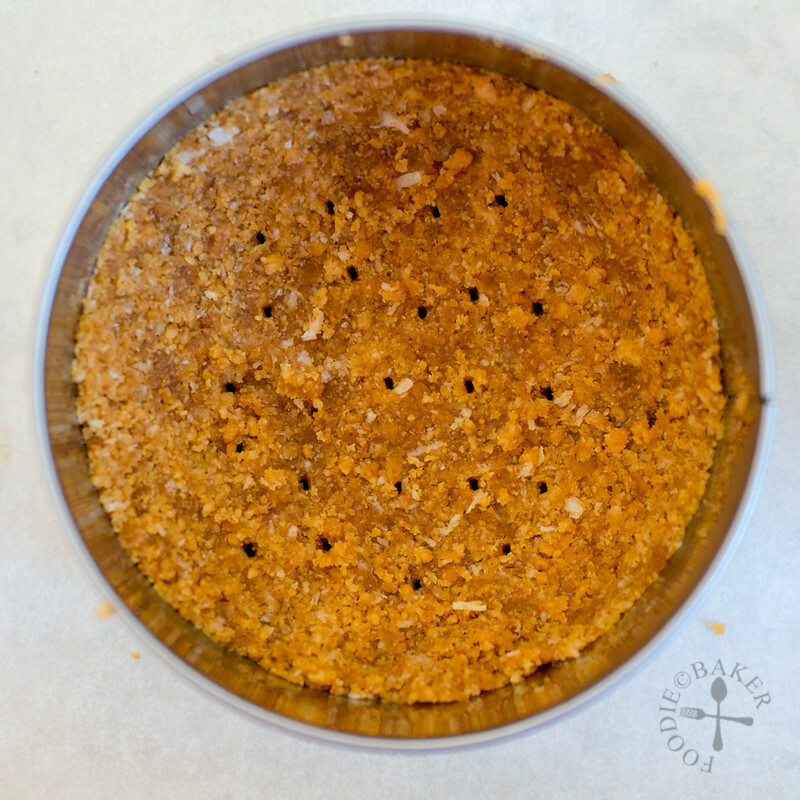 1) Process the biscuits in a food processor or bash with a rolling pin until it resembles fine crumbs. 2) Stir in coconut flakes. 3) Stir in butter until the crumbs are moist. 4) Divide the crumbs among the 4 cake rings and chill in the refrigerator. 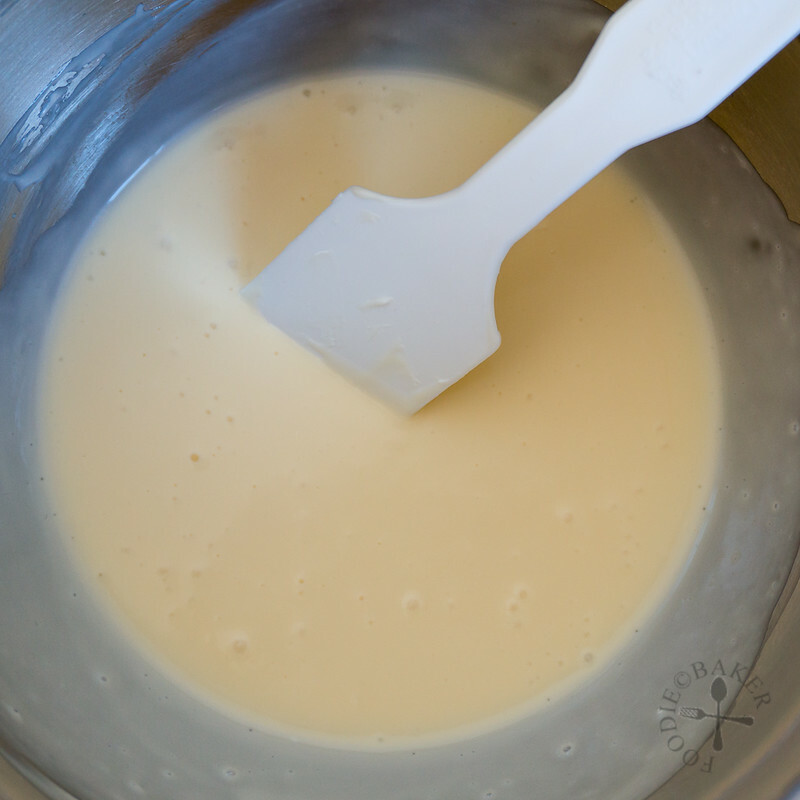 5) Beat cream cheese and sugar on low speed with an electric mixer for 1 to 2 minutes. 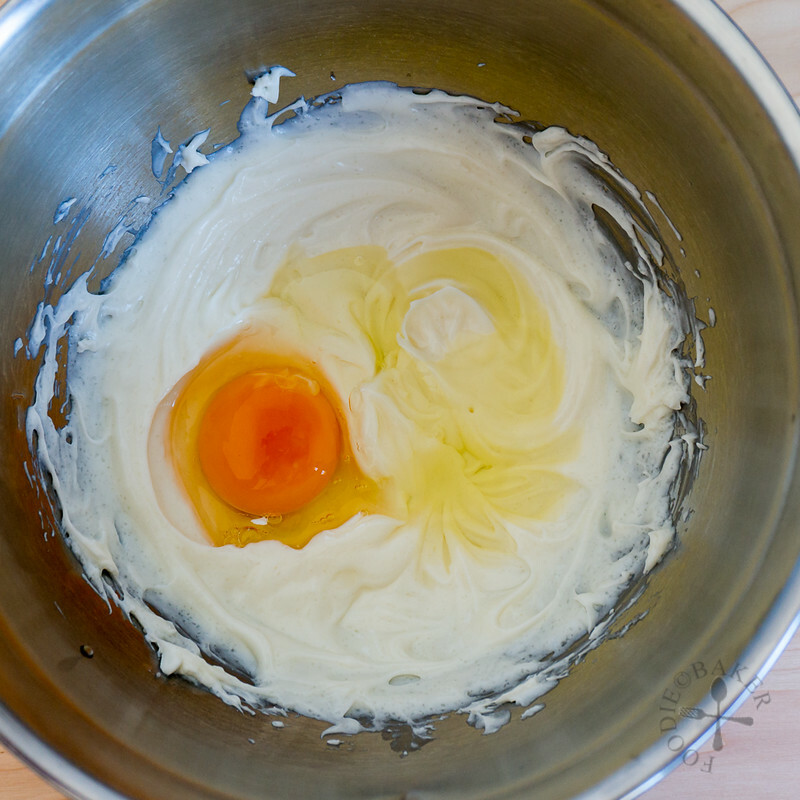 6) Beat in the egg on low speed until incorporated, about 1 minute. 7) Beat in the corn starch, vanilla and salt. 8) And coconut milk as well. 9) Scrape the sides with a rubber spatula to make sure everything is incorporated. 10) Poke holes with a skewer / toothpick / fork on the bottom of the crust so that the crust will not separate from the cheese layer. 11) Divide the cheesecake batter among the cake rings. Gently bang the baking sheet 4 to 5 times on the table counter to release air bubbles. 12) Bake the cheesecakes until the cheesecakes wobble just slightly and a skewer inserted into the center comes out with very little crumbs. 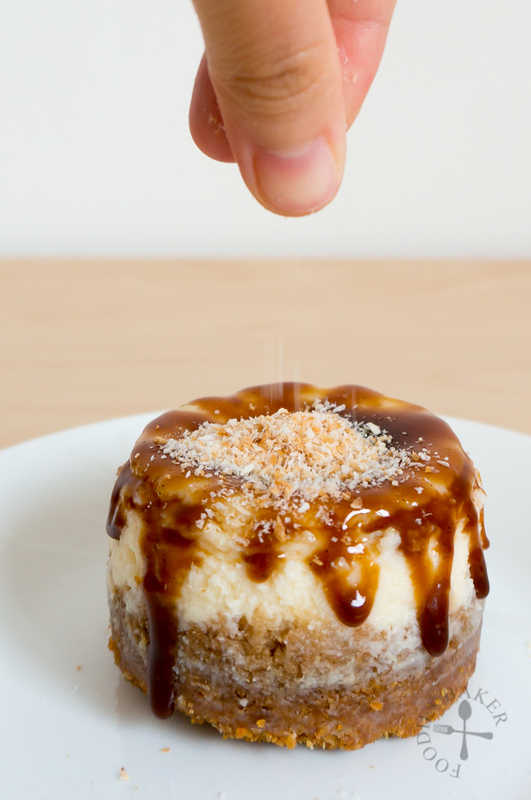 Chill the cheesecake, then serve with butterscotch sauce and toasted coconut flakes! Double the recipe so you can bake this cheesecake in a 7 or 8-inch round tin. Preheat oven to 175C / 350F. Line a baking sheet with baking parchment then place 4 2.5-inch cake rings on top. 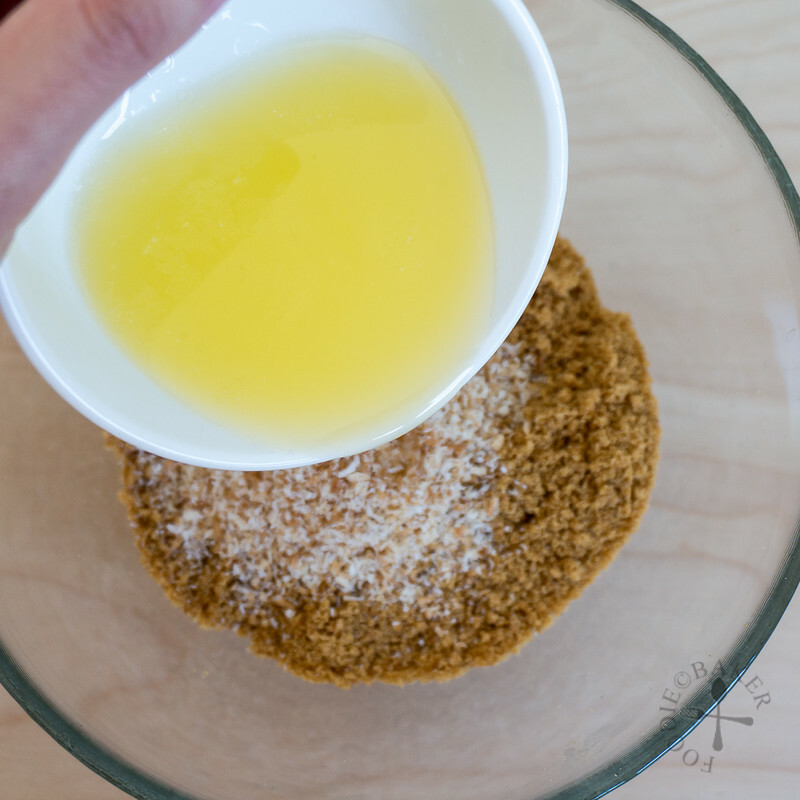 Process the biscuits in a food processor or bash with a rolling pin until it resembles fine crumbs. 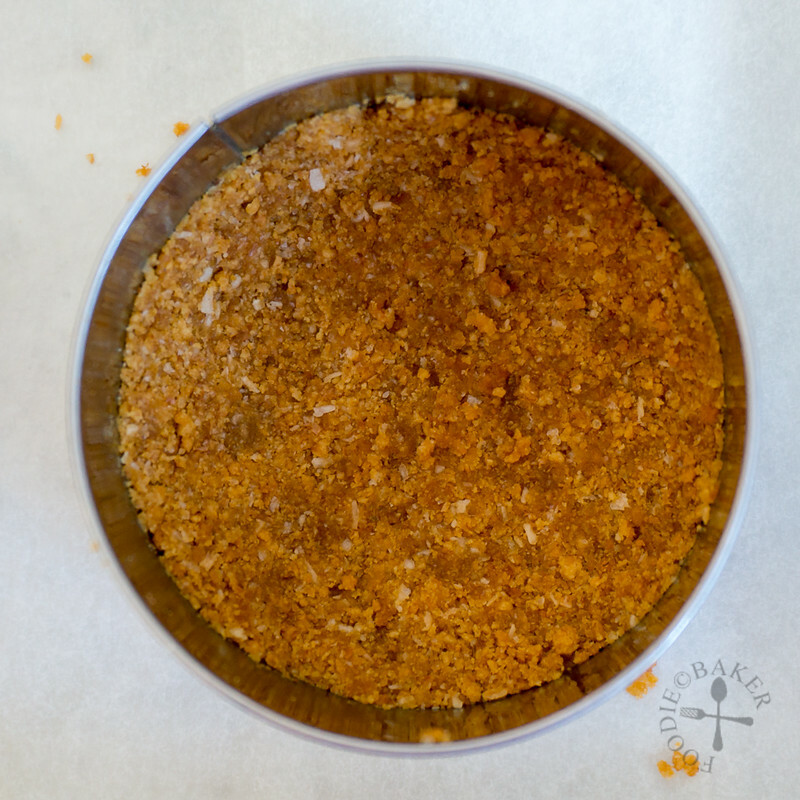 Stir in coconut flakes and butter until the crumbs are moist. Divide the crumbs among the 4 cake rings and chill in the refrigerator while you prepare the cheesecake batter. 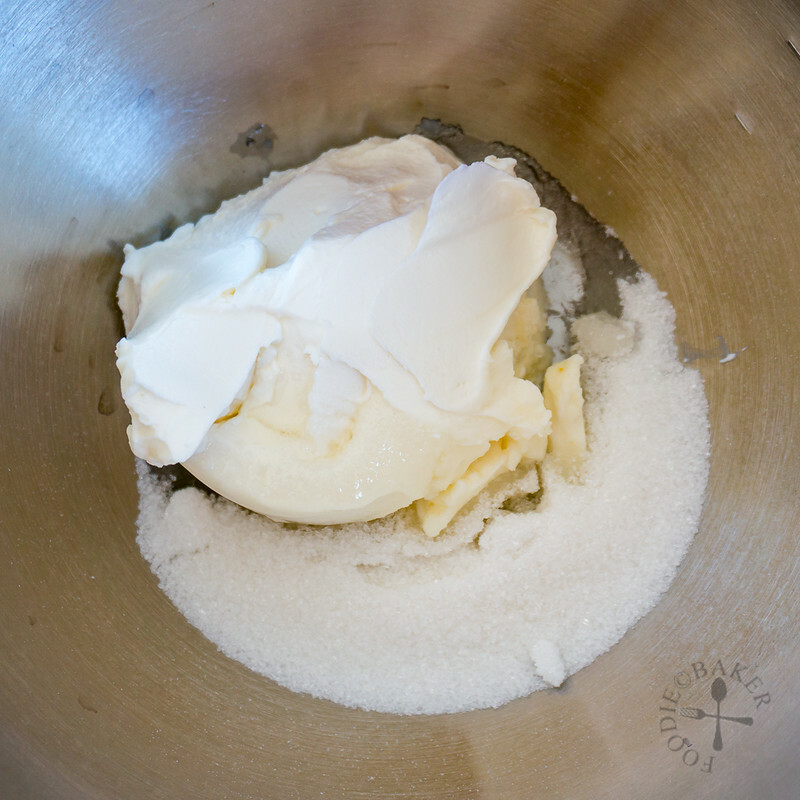 Place the cream cheese and sugar in a mixing bowl. Beat on low speed with an electric mixer for 1 to 2 minutes. Add in egg and beat on low speed until incorporated, about 1 minute. Beat in corn starch, vanilla, salt and coconut milk until incorporated, another 1 minute. Scrape the sides with a rubber spatula to make sure everything is incorporated. Remove the cake ring crusts from the refrigerator. Poke holes with a skewer / toothpick / fork on the bottom of the crust so that the crust will not separate from the cheese layer. Divide the cheesecake batter among the cake rings. Gently bang the baking sheet 4 to 5 times on the table counter to release air bubbles. Bake the cheesecakes for 30 to 35 minutes until the cheesecakes wobble just slightly and a skewer inserted into the center comes out with very little crumbs. Place the baking sheet on a wire rack and let cool completely. 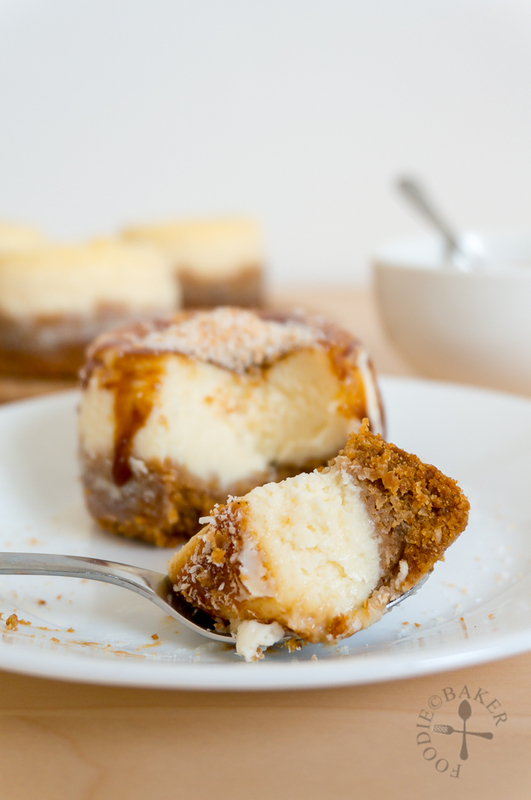 Chill the cheesecakes in the refrigerator for at least 4 hours or overnight. 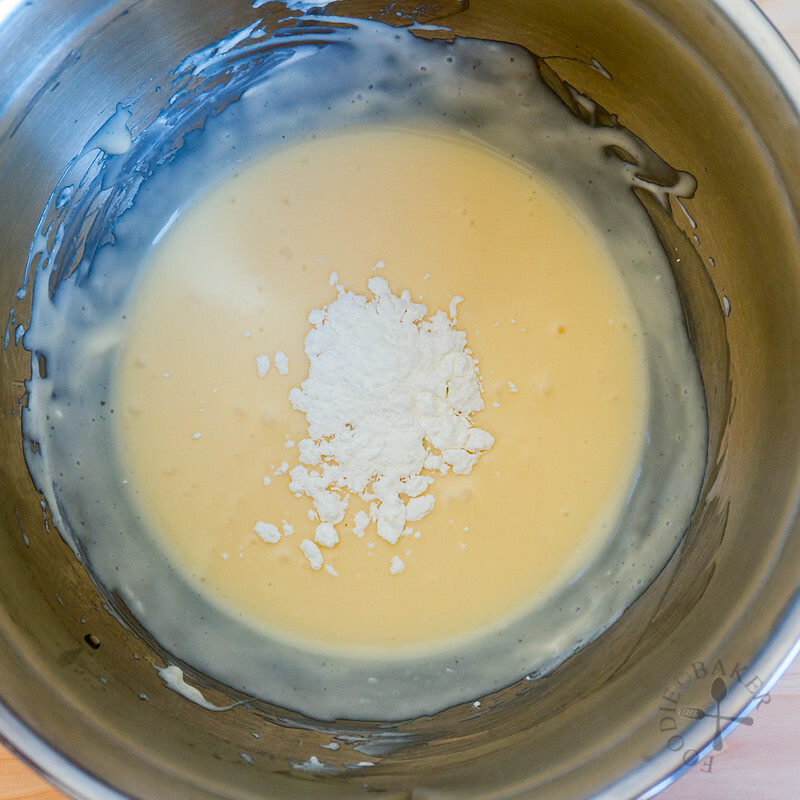 Place butter and sugar in a small pot. Heat on medium heat until the butter has melted. Continue to cook, stirring frequently, until the mixture is liquid-y and less grainy. 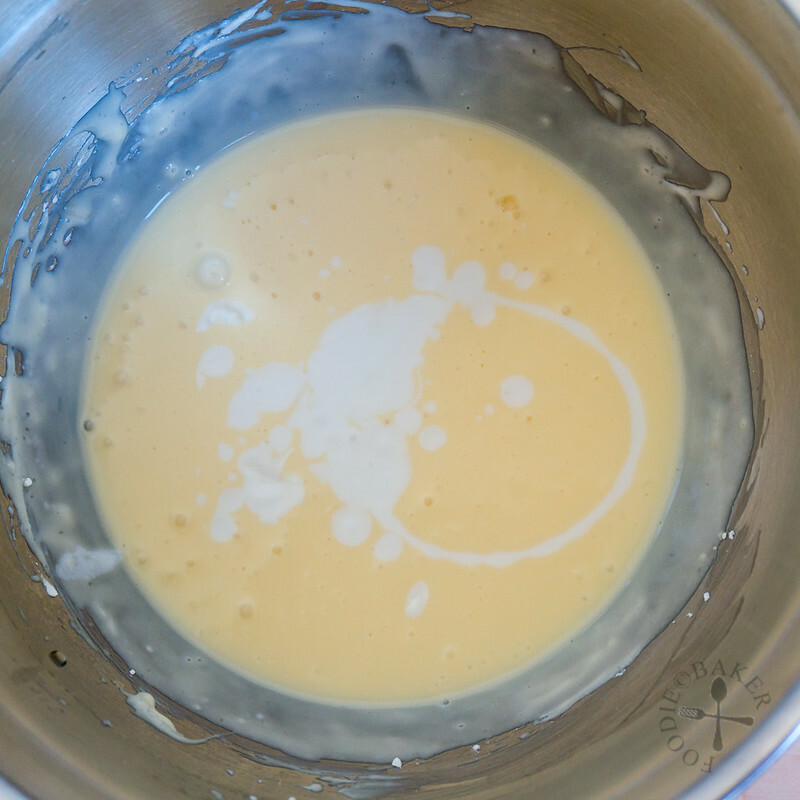 Turn down the heat and whisk in the cream. The mixture will bubble but not to worry. Turn the heat back up to medium and cook until bubbles appear on the sides of the pot, stirring frequently. Remove the pot from heat and stir in vanilla. Taste the sauce (be careful it's very hot!) and stir in additional salt if needed. Let cool to room temperature. Rinse a tea towel in hot water (as hot as your hands can manage) and squeeze dry. Wipe the exterior of a cake ring with the tea towel then using your hands, push out the cheesecake. Place the mini cheesecake on a serving plate. Repeat with other cheesecakes. Drizzle the butterscotch sauce generously over the mini cheesecakes then sprinkle the toasted coconut flakes on top before serving. - To toast the coconut flakes: Toast the coconut flakes in a preheated oven 175C / 350C for about 5 minutes until browned. Those mini cheesecakes looks adorable! I want to make cheesecakes like that size. Thanks Raymund! 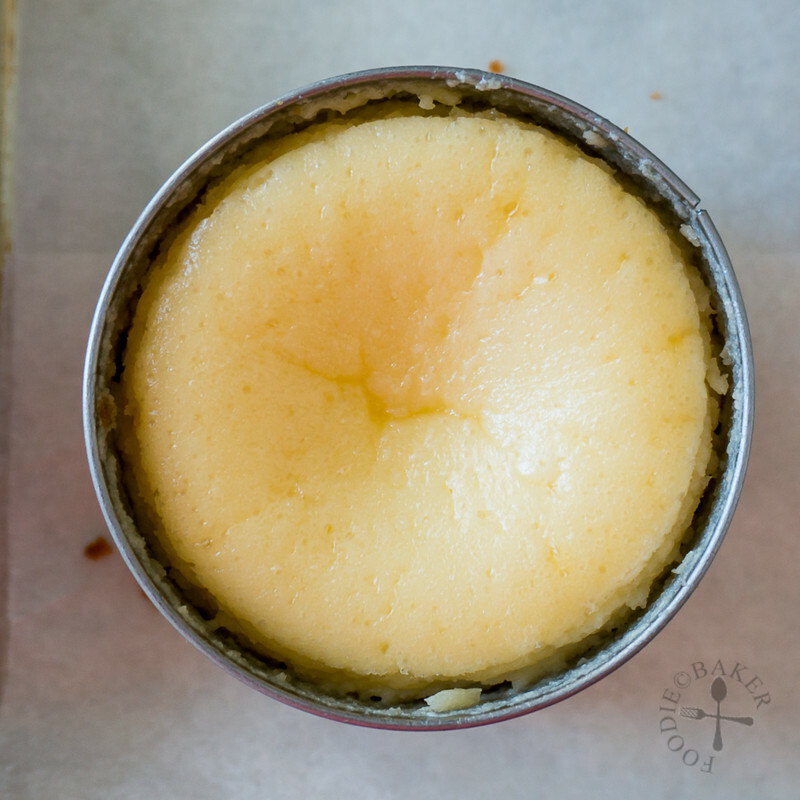 Can’t wait to see your mini cheesecakes on the blog! I’m sure they’d be delicious and cute! I love the minis! I so agree about not sacrificing fats in desserts. That’s what makes them so yummy. What a fabulous blend of ingredients! 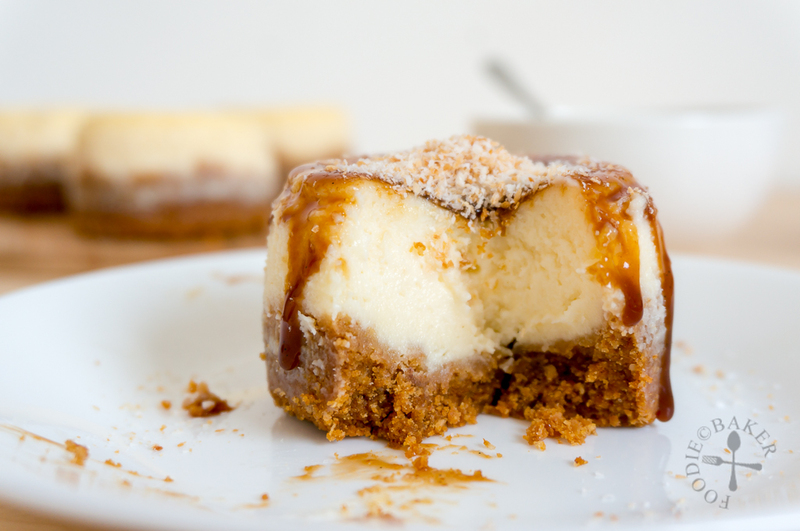 Your little mini cheesecakes look killer good! I love that toasted coconut falling action shot! While your making desserts, I am making curries with coconut milk… LOL Just pinned! Thank you so much Bobbi! I should have saved some of the cheesecakes, and bring them over for dessert after your coconut curry! Awwww you are too sweet Anna! I should be the one who wants to stay with you, you are a professional chef! Means you can cook way better than me! Yes I think we shouldn’t waste our fats eating food that aren’t worth it, glad we are on the same page on this 😉 Thank you so much for sharing these cheesecakes virtually! Wow! I like the different components and imagine that they play off each other really well! Thank you so much Dave! The butterscotch sauce was a delightful addition, I’m glad I made it to go with the cheesecake! Wow, these pictures are just wonderful! I have to agree with you about the light coconut milk. I used some to make a curry and it was just too watery. Thanks for sharing these delicious looking cheesecake bites! Thank you Heather! So sorry to hear about your watery curry! Now we both now which one to get to make our curries! Looks so gorgeous, Jasline! Honestly, I have no idea about any of the coconut products because I don’t really use them. I’m sure you could teach me a thing or two! Thank you Mir! Oh I just found out about them recently too, we can both learn together! When I cook curry, my preference would be rich and thick coconut milk/cream. As age catching up, I’ll try to use coconut milk light for some of my bakes. I love mini cakes too. Your mini cheesecake look so fragrant and yummy. .. so addictive! Hi Karen! I guess light coconut milk does not have as much of an impact on bakes as compared to rich foods like curry. Thank you for the compliments, it’s really addictive and tropical feel… makes me feel like I’m somewhere in Thailand haha! How fabulous to get fresh coconut milk and cream! I’m with you. I don’t like light milk, coconut or cow’s. I have to use so much more to get the flavour I like! I’m glad I’m not the only one on the no-light-things-please wagon! How true! Some light products just don’t work! 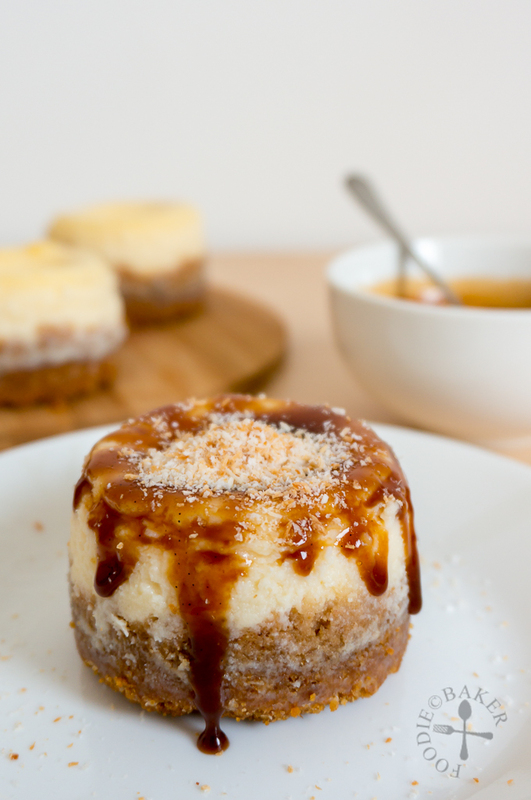 These mini cheesecakes look so lovely and delicious, Jasline. I guess some people will say YOLO (you only live once), so we shouldn’t waste our fats on stuff that’s not worth it 😉 Thanks for dropping by as always Angie!